At Naumes, Inc., the standard we set is to challenge our orchard teams to lead the industry in growing technology and our packing houses to produce the finest fresh fruit pack available. 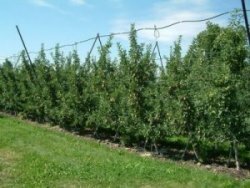 Some of our orchards are grown on post and wire trellises, which maximize the bearing surface of the trees and thus increases productivity. Some of our trees are grown with this Tatura system of trellising. We train trees on central leaders to yield more fruit and larger sizes. Wood spreaders are utilized, positioning branches for optimal light interception and to maximize bearing surface area. We have double-rowed orchards to make them even more productive, increasing trees per acre from 70 to 400 and more. Our modern orchards have small trees that can be reached from the ground, making pruning and picking easier, safer and less expensive. Our ecologically conscious company maintains integrated pest management techniques utilizing pheromone based mating disruption. These products along with newly developing biocontrols and beneficial insect releases are geared toward reducing synthetic pesticide usage while producing visually aesthetic and healthy fruit for our customers. New low-flow irrigation methods deliver water through a system of hoses and microsprinklers. Trees are irrigated more often and with less water because the water is delivered directly to the roots.